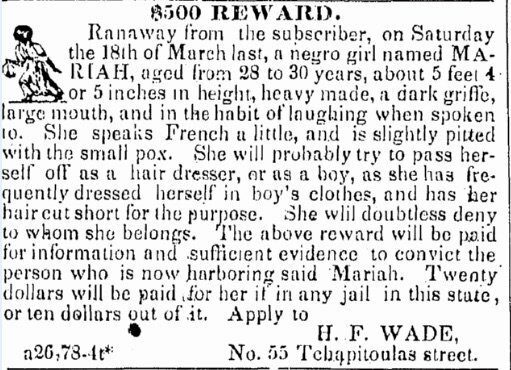 Image: Ad — $500 reward for Mariah, offered by H. F. Wade in The Daily Picayune. 1837. More here. “Readers of the May 24, 1796 Pennsylvania Gazette found an advertisementoffering ten dollars to any person who would apprehend Oney Judge, an enslaved woman who had fled from President George Washington’s Virginia plantation, Mount Vernon. The notice described her in detail as a “light mulatto girl, much freckled, with very black eyes and bushy black hair,” as well as her skills at mending clothes, and that she “may attempt to escape by water … it is probable she will attempt to pass as a free woman, and has, it is said, wherewithal to pay her passage.” She did indeed board a ship called the Nancy and made it to New Hampshire, where she later married a free black sailor, although she was herself never freed by the Washingtons and remained a fugitive. The advertisement is one of thousands that were printed in newspapers during colonial and pre-Civil War slavery in the United States. The Freedom on the Move (FOTM) public database project, now being developed at Cornell University, is the first major digital database to organize together North American fugitive slave ads from regional, state, and other collections. FOTM recently received its second of its two National Endowment for the Humanities (NEH) digital humanities grants.